Sister of Valor books are available through your local bookstore, library or from your favorite online retailer. “This is a truly amazing book of the Military Wife sisterhood. It doesn't matter if you are a former spouse, current spouse, or what year you were a military spouse. 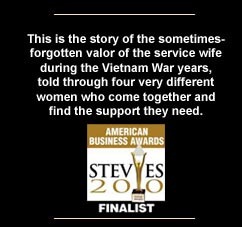 You will find yourself captivated by the stories of these four woman who had to say good-bye to their husbands as they went off to the Vietnam War. As a military wife 35 years after the Vietnam War ended, I found myself relating to every detail of these women's lives, as they learned to cope with learning how to deal with things on their own. Kids, house, bills, sadness, lonely nights, holidays, and everything in between. I myself always wondered what it would have been like to be a military spouse in the past. I always assumed it would have been so much different than being a military spouse in today's world. But it's not. They faced the same fears, the same obstacles. Nothing has changed but time. This is a MUST read for any military spouse whether past or present. You will not be able to put this book down, and you may, as I did, also find comfort in knowing you are never alone." “Vietnam consumed the lives of thousands of Americans. 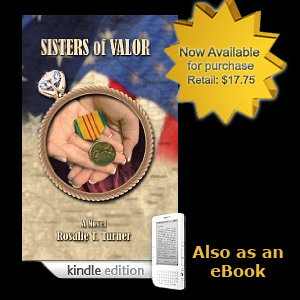 'Sisters of Valor' is a novel telling of [four] women coping with the fact that their husbands are fighting the least popular war in American history. A story bringing the chaotic era of the late 1960s to a new perspective, "Sisters of Valor" draws upon the life experience of author Rosalie Turner and brings readers a fine, moving story. "Sisters of Valor" could strike a chord for those with family members currently serving their country abroad."